Armagedda was a two-man Swedish black metal band that released three acclaimed albums between 2001 and 2004 before, unfortunately, splitting up. There have been a couple of releases since the band's demise that have given avid fans the chance to hear never before heard Armagedda songs and live performances. This new EP is another such release and contains four previously unreleased tracks from the 2001-2002 period of Armagedda. 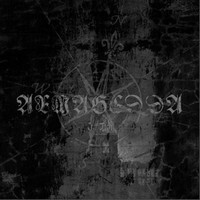 It is unfortunate that Armagedda will never release another new album again. They were undoubtedly one of the premier black metal bands in the world with each of their three albums being a classic of the genre. This EP is another fine addition to the band's legacy. For those who are already fans I Am is a short release showcasing the classic Armagedda sound. Each of the four tracks is excellent and range from slower songs like the title track to the fast closer, Col Eon, which becomes with some horrifying shrieks. If you have never heard Armagedda before and want to know what they sound like before buying a full length then this EP is perfect.